Butcher, Baker, Waffle Stick Maker. My sister bought me a waffle stick maker for Christmas and these may be my new favourite thing. You could have them with coffee and maple syrup. 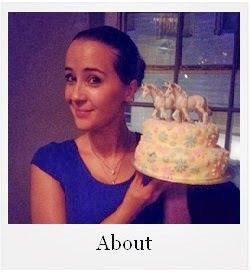 Like an adult. But let&apos;s face it. If I can get away with eating chocolate for breakfast, I&apos;m going to do it. A little fresh clementine zest is good too. Recipe adapted from here. The below recipe yields a huge amount. 1, Preheat your waffle stick maker as per the manufacturers instructions. I brushed mine lightly with a little rapeseed oil on a pastry brush first. 2, Make the waffle batter first by whisking the dry ingredients together so they are through mixed. 3, In a separate bowl, beat the milk, eggs and oil together. 4, Make a well in the dry ingredients and slowly beat in the wet. Whisk together until you have a smooth batter. 5, Fill the waffle maker with batter and clamp down the lid. Each batch takes around 3-5 minutes. I flipped over some of the ones at either end of the waffle maker as they didn&apos;t seem to cook as well as the ones in the centre. 6, Keep them warm in a low oven until you&apos;re ready to serve. 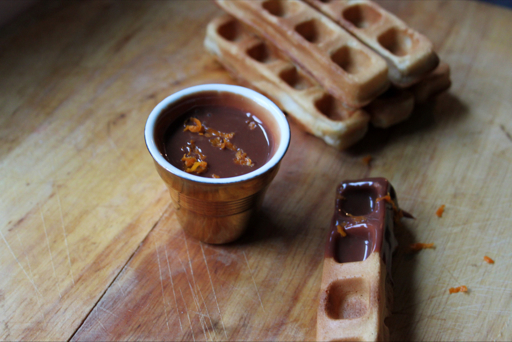 7, Whilst the last couple of batches of waffles are cooking, make the sauce by bringing the cream to a light boil in a small saucepan. Remove from the heat and stir in the chocolate until melted. You can add in flavourings like lemon/orange zest at this point. 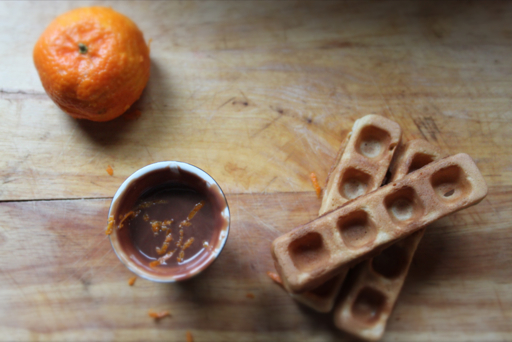 8, Serve waffles with the warm sauce. How amazing are these! 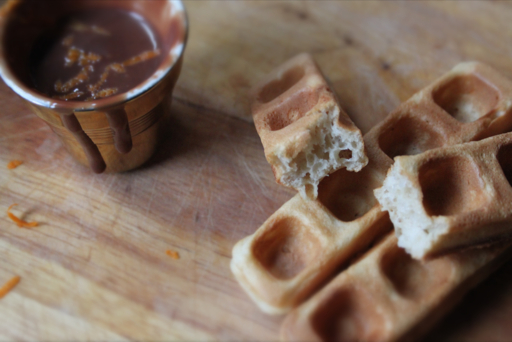 I have never heard of a waffle stick maker but they are perfect for dipping! YUM! Thank you Marcellina. They're really good for dipping, will be looking at savoury ones soon too! These look delicious. They remind me of Spanish chocolate and churros. Thank you searchingforspice, I have a very soft spot in my heart for churros! Oh my goodness - these look incredible! I've been tempted to buy a waffle iron for such a long time but don't trust myself - I'd eat waffles day and night! Wow these look ridiculously good and the photos are just superb! Thank you Genevie, I just need to stop eating them with chocolate! Waffle sticks are just brilliant. Love them . For me , I would have a little dipping bowl of maple syrup. Good sister present choice! Thank you Laura, I think you're right on having maple syrup, you could waffles and syrup within 10 minutes with these too! Interesting...I've never heard of a waffle stick maker before...but I think I want one!! 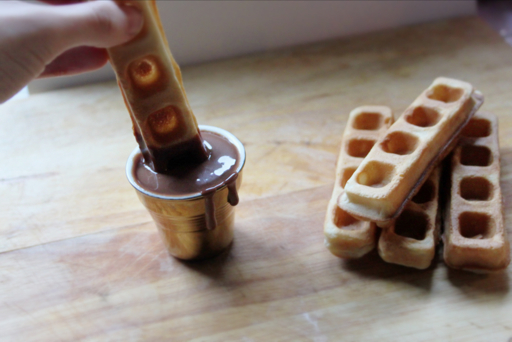 I probably wouldn't eat and make a waffle but if you make waffle sticks you can make them, dip them and share them!! 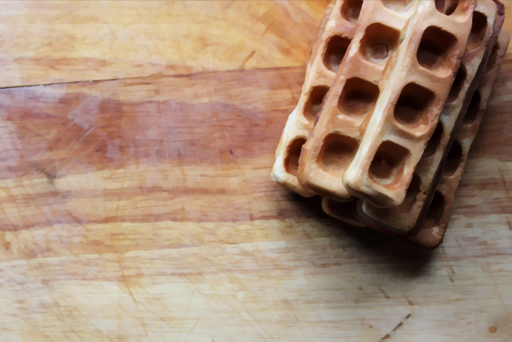 Great idea:-) What deos a waffle stick maker look like? 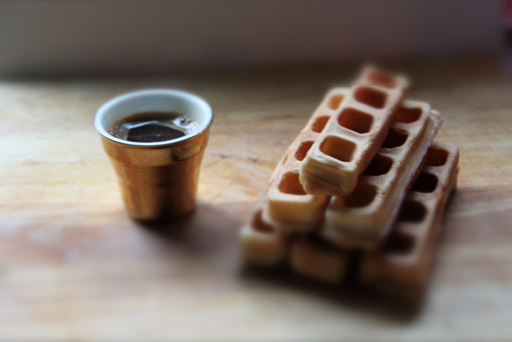 I have not seen a waffle stick maker and these little treats look so cool. Got to google for one! If I could get away with eating these for breakfast everyday, I would! They're like a sweet version of egg and soldiers. Delicious!